NASA'sPhoenix Mars Lander went into an inactive ?safe mode? late Tuesday triggered bydeteriorating weather conditions. The spacecraft also unexpectedly switched toits second set of redundant electronics and shut down one of its batteries. As theMartian northern hemisphere, where Phoenixlanded on May 25, transitions from summer to fall, the amount of sunlightavailable to the lander has dwindled and temperatures at Phoenix'slanding site have been steadily dropping. Thespacecraft?s declining health is no surprise to mission managers, who hadplanned way in advance for this seasonal change. Phoenix?s primary missionended in late August. "Thisis a precarious time for Phoenix," said Phoenix Project Manager BarryGoldstein of NASA's Jet Propulsion Laboratory (JPL) in Pasadena, Calif.? "We're in the bonus round of the extended mission, and we're aware that theend could come at any time. 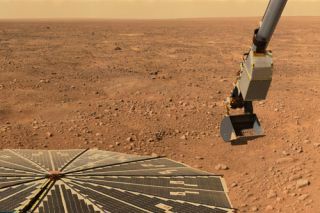 The engineering team is doing all it can tokeep the spacecraft alive and collecting science, but at this pointsurvivability depends on some factors out of our control, such as the weatherand temperatures on Mars." In recentdays, temperatures have fallen significantly, dipping down overnight to minus 141degrees Fahrenheit (minus 96 degrees Celsius) and only reaching minus 50degrees Fahrenheit (minus 45 degrees Celsius) during the day, the lowesttemperatures so far for the mission. This weather brought on a ?low-powerfault? on Phoenix, presumably a failure that the spacecraft detected andresponded to by entering its power-saving safe mode. To makematters worse, a mild dust storm blowing through Phoenix?s north polar landingsite, along with accumulating water-ice clouds in the atmosphere, has reducedthe amount of sunlight reaching the spacecraft, further hindering recent attemptsto keep it up and running for as long as possible. Phoenix has been operating in the Martianarctic for more than five months, diggingup samples of dirt and rock-hard subsurface water ice and analyzing themfor signs of past potential habitability. Phoenix finished gathering itsremaining samples last week. All of thelander?s science activities have been put on hold for the next several days toallow the spacecraft to recharge and conserve power. Mission controllers won'ttry to resume normal operations before the weekend. The abilityto communicate with the lander has not been affected, but the team decided tocancel communication sessions on Wednesday morning in order to conserve power. On Tuesday,the mission announcedplans to turn off four of the spacecraft's heaters, one at a time, toconserve power for the remainder of the mission. The low-power faults late onTuesday prompted engineers to shut down two heaters instead of one asoriginally planned. One ofthose heaters warmed the electronics for Phoenix's robotic arm, robotic-armcamera, and Thermal and Evolved-Gas Analyzer (TEGA), which bakes samples andanalyzes the vapors given off to determine the samples' composition. The secondheater served the lander's pyrotechnic initiation unit, which hasn't been usedsince landing. Mission controllers hope that switching offthe two heaters will preserve enough power to keep the lander's camera andmeteorological instruments running. Theengineering team anticipates that Phoenix will essentially serve as ameteorological station once its power supplies dip enough that most instrumentscan no longer be run and kept within their optimal temperature range. Missionplanners previously predicted that Phoenix would no longer have enough powerfor any operations by the end of November/beginning of December. But just whenthe lander will truly die is uncertain. "Itcould be a matter of days, or weeks, before the daily power generated by Phoenix is less than needed to operate the spacecraft," said JPL mission manager ChrisLewicki. "We have only a few options left to reduce the energyusage."